Home History History of Boone County: The Bankable Cigar by N.N. Smith Co.
History of Boone County: The Bankable Cigar by N.N. Smith Co.
My assignment for this month is to write two articles. The first one was scheduled to be about Zionsville’s first-ever elected mayor, Tim Haak. The second article was supposed to be about the history of Boone County. As you can see by the title of this post, I’ve reversed that order. Let me tell you why I made that decision. When it came time to write the first article, I wanted to shoot some photos to accompany it. Fortunately, the winter weather was absolutely fantastic—47 degrees without a cloud in the clear blue sky. Luck was on my side, so I grabbed my Nikon and hit the road. My intention was to shoot some photos of the Zionsville Town Hall for the first article, then head north on I-65 to grab some shots in Lebanon of the Boone County Courthouse and the Boone County Historical Society for the second article. After I had taken photos of the exterior of the Zionsville Town Hall, I decided to enter the building to see if I could acquire a shot of the door of the new mayor’s office—if luck was really on my side—which I assumed was located in the building. None of the signage outside of Town Hall referred to the mayor, I guess due to the position being so new. I entered the main office inside and asked one of the people working there if Mayor Haak’s office is located in the building. It is. (I apologize for not taking note of the name and title of the very nice woman who helped me, but I’ll try to include that information in the next article.) I asked if I could shoot a photo of the mayor’s office door. As could be expected, I was told it would be best if I called by phone to schedule an appointment, in case the office needed to be tidied up, which is understandable. I then was given the mayor’s business card. It was just a few minutes after 4:00 PM, so I thought about calling from my car to request an appointment, but I decided to wait until the next day, because I did not want to lose the sunlight and crystal-clear sky for my photos in Lebanon. Of course, that desire did not prevent me from quickly buying a cup of coffee from the Starbucks next door before I headed north. No matter what, coffee is always priority #1. Twenty minutes later, I arrived in downtown Lebanon. I had never been there before, so I was a bit awestruck when I laid eyes upon the mammoth stone structure that dominates the center of the city. I took some photos of the magnificent Boone County Courthouse, located between Main St. and the Courthouse Square section of Washington St. It was built in the Classic Revival style (aka Neo-classical) at the beginning of the 20th century. 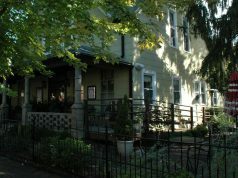 It was listed in the National Register of Historic Places (NRHP) in 1986. The carving above the Washington St. entrance of the courthouse states it was “ERECTED ANNO DOMINI MDCCCCIX” (Medieval Latin for “In the year of the Lord 1909). The NRHP nomination form states it “was ordered by the county commissioners in 1909,” along with “The building was completed in December, 1911, at a total cost of $265,000.” I wonder how much it would cost today to build such a structure. I suspect it could never happen, given today’s taxpayer mindset about government spending. I’m thankful the citizens of Boone County had a different perspective over a century ago. I stopped to take a handful of photographs of the building and then continued walking toward the Historical Society, without giving it any additional thought. After just a few more steps, I approached the V.F.W. Post #910 building on my side of the street, which I assumed had some interesting history associated with it, so I shot a few photos of its signage and the murals embedded on the front wall. Then I approached a very old house that has a large banner hung on the curved porch railing: “Rent For Your Event.” I had arrived at the historic Cragun House, built in 1893, which contains the Boone County Historical Society. OMG! I’m not from the area, so I had no notion of what to expect. I know a lot of very old houses are still standing in Indiana, and I’ve seen many of them during my two decades living here, but this awesome beauty caught me by surprise. The Cragun House is an incredible piece of Queen Anne architecture and slice of history, which joined the courthouse in the National Register of Historic Places in 2011. I’m not sure what took so long to obtain that designation, but if any house deserves that recognition and protection, this is obviously it. FYI, its official name is the Strange Nathanial Cragun House. A sign posted in the window next to the front door indicated the Society was not open for business or visitors, but I suspect it contains enough history inside to warrant several more, if not many, articles about the history of Boone County. I only shot about 20 photos of the pale green three-story house, so I’m sure I’ll be back in the not-too-distant future to take more—and to learn more about this wonderful almost-125-year-old edifice and the story of the county that developed around it and the courthouse. Speaking of stories, this one has only just begun, because as interesting as the Cragun House is, so too is the tale of the plain brick apartment building across the street. When I arrived back at my desk, the deadline for this article had already passed. (Fortunately, the folks who manage this website are forgiving in that regard.) 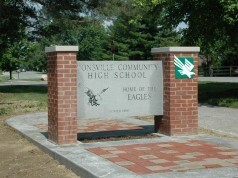 Though I had some photos in hand, I had not yet done any research about Zionsville’s new mayor. I was now hoping to be able to schedule a photo-shoot of the mayor’s office—and if I am really lucky to be able to obtain a few photographs of him. And, if my cup runneth over* with luck, to conduct a brief interview with him. But, I assume it will be several days or more before that can happen, so I figured I could reverse the schedule of this month’s articles and write about the history of Boone County first. I reasoned that as long as I deliver a decent article, that would suffice. My initial intention at that point was to search the Internet for enough information about Cragun House to compose a brief article, which would also include a bunch of the photos I just obtained. Because the house is an official part of our national history, I correctly assumed quite a bit of info about it exists online. But before I started writing, I wanted to review and catalog the batch of photos I had just shot. As I was previewing the images, I came upon the few photos of the N.N. Smith Co. building, which further piqued my curiosity about it. Naturally, I started searching the Web to see if I could come up with any information about this building. Lo and behold, this rather nondescript apartment house has a very compelling story of its own. A-ha. A clue. A bit more research revealed that located at the address 407 N. Main St. in Frankfort is a 3-story brick building that was home to the National Cigar Corporation. As soon as I saw a photo of this building, I knew immediately that it and the building in Lebanon were both designed by the same architect. Very interesting. The 3-story building in Frankfort, which is in Clinton County, is 25 miles due north of the 2-story building in Lebanon. No address is shown on the apartment building in Lebanon, but the Realtor.com website indicates the address of the N.N. 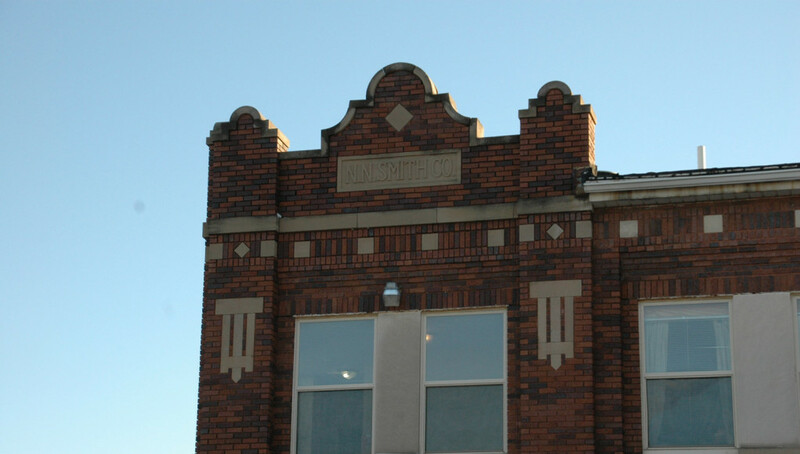 Smith Co. building is 301 W. Main Street—and that it was built in 1923. I was a bit confused at that point, because the IndianaHistory.org website has a written guide for Charles Fremont Scott Neal Photographs, 1901-1935 (Collection # P 0023) that indicates the 2-story building “was built in 1921 by N.N. Smith, of Frankfort as his Lebanon Bankable Cigar Factory.” I suspect the Realtor.com information is correct, because it’s rather important that the build date in real estate listings is accurate. So, it seemed to me that N.N. 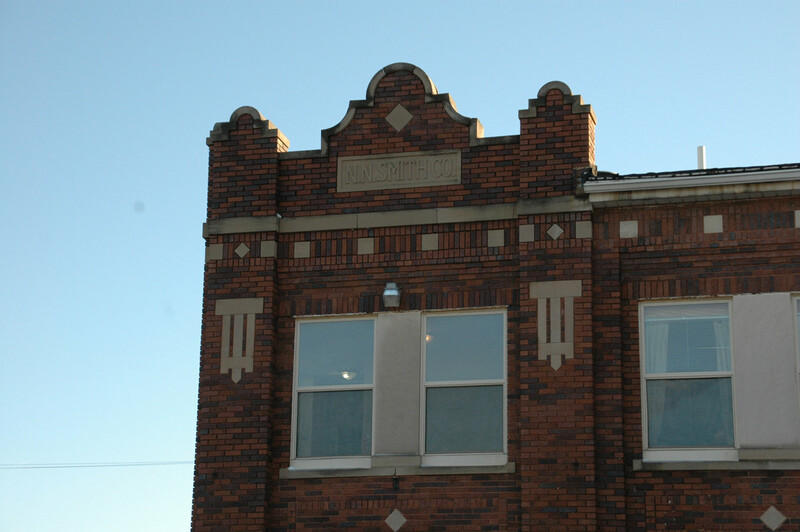 Smith had a cigar factory in Frankfort that was built in 1917, according to the Berkshire Hathaway real estate listing, and in 1922 he decided to expand operations by building a second factory in Lebanon. I also found a copy of the July 31, 1915 edition of the Indianapolis Recorder newspaper, which contained an advertisement for the Bankable, along with a small advertorial piece that stated “N.N. Smith Co. started 3 years ago to produce a good smoke for cigar lovers. He has reached his acme of fame in ‘The Bankable’ which is now having such a demand that he has to employ 200 people to fill his orders Invest your nickle in a Bankable Cigar and draw interest with every smoke.” Gotta love that tagline. If you’ve read this far, I suspect you find this sliver of Boone County history as fascinating as I do. It’s certainly not the story I set out to write, but when my curiosity hooked into this puzzle, I couldn’t let it go until I put the missing jigsaw pieces together. 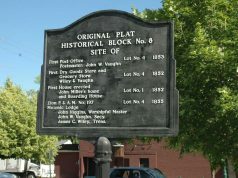 After I solved the mystery of the plain brick building on W. Main St., I was too excited to wait a few weeks to write the story. That’s the primary reason why I decided to reverse the order of this month’s scheduled posts. I thank you for reading this one. Click the additional resource links below to learn more about this unique chapter of the history of Boone County (and Clinton County), as well as to see some wonderful Bankable Cigar collectibles and artwork. I’m looking forward to eventually learning and reporting about the Cragun House, so be sure to check back for that article. And don’t forget that my next blog post will be about Zionsville’s first-ever elected mayor. I hope to interview Mayor Tim Haak for the story, to find out his perspective of what makes this community a great place in which to buy your first home. Check out the links below for additional images, info, and a video about the Bankable and the National Cigar Corp.
Video: Jerry Greene, plant manager at National Cigar Corp., discusses his 50 years at the company.